This season seems like last season in at least one aspect, the Toronto Maple Leafs and Boston Bruins will meet again in the first round of the Stanley Cup Playoffs. In this post I want to offer a bit of history for hockey fans from either team about the rivalry of these two Original Six teams. Here is the Maple Leafs vs. the Bruins, and the building of this recent rivalry. The Bruins are an Original Six team and were the first American team to join the NHL in 1924. Success soon followed, and the Bruins beat the New York Rangers to win the Stanley Cup in 1929. It was the first Stanley Cup Final in NHL history with two American teams. During the 1960s, the Bruins were not a strong team, and finished last in the NHL six of seven seasons between 1960–61 and 1966–67. However, the amazing Bobby Orr and the high-scoring Phil Esposito emerged, and the Bruins won the Stanley Cup in 1970 for the team’s first championship in 29 seasons. 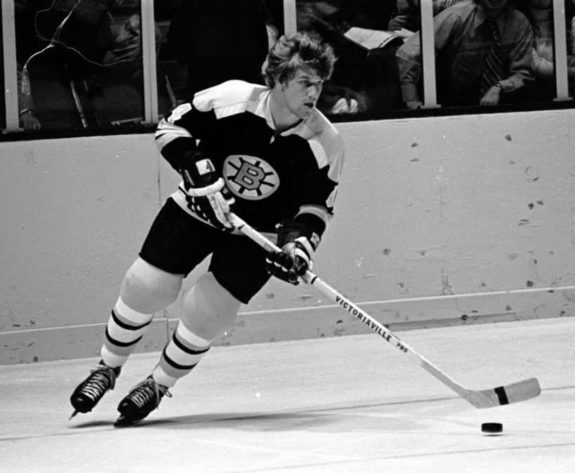 Orr left the team after the 1975–76 season after winning three NHL MVP awards (1970–72) and leading the team to another Stanley Cup in 1972. Sadly, the great defenseman had knee surgery more than a dozen times during his career and had to retire far too early. Esposito was traded to the Rangers early in the 1975-76 season and played six seasons there prior to his retirement. In 1979, Ray Bourque joined the Bruins and played with the team for almost 20 seasons. He helped the Bruins grow into the consistently solid team it remains today. During the Orr, Esposito, and Bourque eras, the Bruins set an NHL-record with 29 consecutive playoff appearances. Unfortunately, those playoff appearances came during the same time period when the great New York Islanders, Montreal Canadiens, and Edmonton Oilers teams also played. The last Bruins’ Stanley Cup win was the 2010-11 season, and they reached the Final again in the 2012-13 season. In 1917, the Maple Leafs helped found the NHL and the team won two Stanley Cups in the league’s first five seasons (1917–18 and 1921–22). In total, the Maple Leafs have 13 Stanley Cup victories. During the 1931–32 season, they were led by the “Kid Line” of Charlie Conacher, Busher Jackson, and Joe Primeau (all less than 26 years old and future Hall of Famers) to a third Stanley Cup. In the 1960s, a Maple Leafs team led by coach Punch Imlach and full of future Hall of Famers (George Armstrong, Johnny Bower, Red Kelly, Dave Keon, Tim Horton, Frank Mahovlich, Bob Pulford, and Allan Stanley), won three Stanley Cups in a row from 1961–62 to 1963–64 and a Stanley Cup in the 1966–67 season. That was the team’s last Stanley Cup victory. The Maple Leafs of the 1970s and 1980s, although led by stars like Darryl Sittler and Börje Salming, never finished higher than third in their division nor got past the second round of the playoffs. In the 1990s, not even Mats Sundin, who became the team’s all-time scoring leader, could lead the team past the conference finals. The 2013-14 season was interesting because it was a lockout-shortened season where teams played only 48 games and the playoffs were pushed to a later date. That season, the Bruins made the Stanley Cup Final but were defeated by a strong Chicago Blackhawks team led by Patrick Kane. The 2013 Stanley Cup Playoffs also were interesting because they marked the first time since 1995-96 that every Original Six team made the playoffs in the same season. The Maple Leafs finally made the playoffs after being shut out for almost a decade (since the 2003-04 season). That season’s team broke one of the NHL’s longest playoff droughts in its history, which suggests how bad a team the Maple Leafs had been. Related: Lessons From the Bruins’ Win Over the Maple Leafs? The Bruins were fourth in the Eastern Conference with 62 points. The Maple Leafs, with 57 points, finished fifth. This marked the 14th playoff series between the teams, and the Maple Leafs had won eight of those 13 series. These two teams had not met in the playoffs since 1974, when the Bruins beat the Maple Leafs three games to one. The Maple Leafs should have actually won this series, and only a great Bruins’ rally (they were behind 4–1 in the third period of Game 7) gave them a chance to win, which they did 5–4. The Maple Leafs made a great come back earlier in the series, after the Bruins led the series 3–1. During Game 1, current Bruin David Krejci scored a goal and two assists in a 4-1 Bruins’ win. In Game 2, Joffrey Lupul scored two goals to lead the Maple Leafs to a 4–2 win. 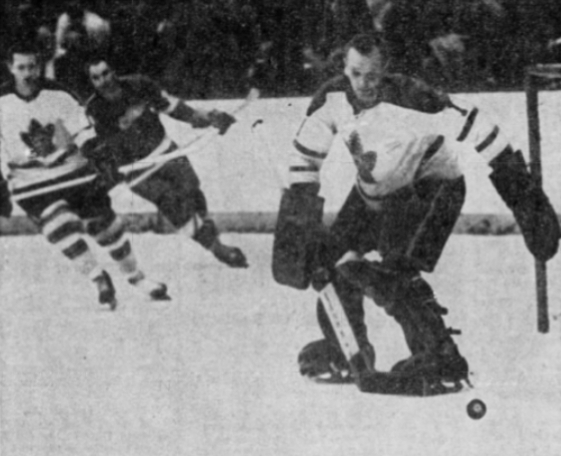 Then, the Bruins took Game 3, 5–2, with current Bruins goalie Tuukka Rask standing on his head (saving 45 of 47 shots). Krejci again scored in overtime to give the Bruins a Game-4 victory 4–3. But the Maple Leafs responded. In Games 5 and 6, goalie James Reimer stood tall and the team won both games by the same 2–1 score. Reimer had 43 saves in Game 6 and blocked 29 of 30 in Game 6. Game 7 started as if it would be a Maple Leafs’ blowout. Cody Franson scored two goals, and the team led 4–1. But, the Bruins got lucky. They scored mid-third period and then, with two minutes left in regulation, they pulled Rask for an extra attacker. It worked: Milan Lucic and Patrice Bergeron both scored and the rest is history. Bergeron scored again in overtime and the Maple Leafs left empty-handed. Last season, the Bruins also beat the Maple Leafs four games to three in round one. These Stanley Cup Playoffs were interesting in two ways. First, the Washington Capitals won the first Stanley Cup in franchise history. Second, they beat the Vegas Golden Knights, who were living a dream by even making the playoffs. The Golden Knights were the first team to make the playoffs in their inaugural season since WHA expansion days (1979-80) when both the Hartford Whalers and the Edmonton Oilers made the playoffs. The Golden Knights were also the first expansion team ever to make the playoffs. Similar to this season, the Tampa Bay Lightning led the Eastern Conference, the Bruins second, and the Maple Leafs third. During the regular season, the Maple Leafs had the Bruins’ number and won three of four games. But, that changed. 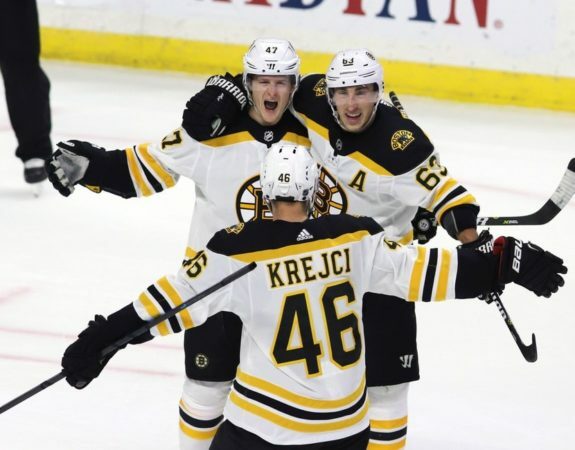 Game 1 was a blowout, and the Bruins won 5–1. In Game 2, David Pastrnak’s hat trick and three assists led the Bruins to another easy win. 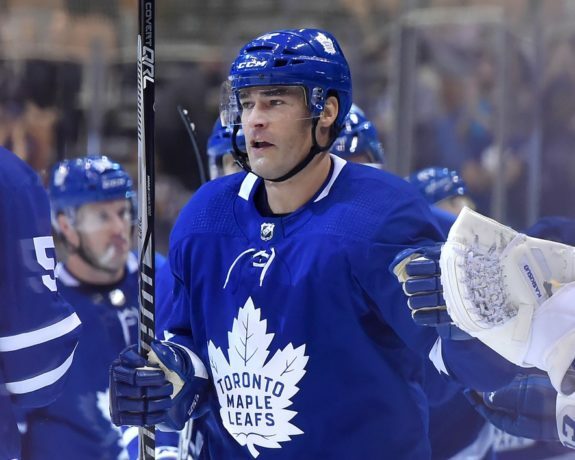 The Maple Leafs took Game 3 4-2, led by Patrick Marleau’s two goals. But Maple Leafs’ hope took a dive when the Bruins took a 3–1 series lead in Game 4. Then, the Maple Leafs pushed back. In Game 5, Frederik Andersen made 42 saves and the team held off the Bruins 4-3. In Game 6, Nikita Zaitsev led the team with two assists and the Maple Leafs won 3-1. However, success was short-lived, and in Game 7, Bergeron’s goal and two assists helped the Bruins win 7–4. This season the Maple Leafs enter the series as underdogs. The Bruins have easily won the season’s series and have the swagger. They have more points and more “pounds” (they are the more physical team). In fact, many Maple Leaf fans wonder if their team has much of a chance because the Bruins’ seem to match up so well. Related: Maple Leafs’ Management: Trouble in Toronto? That said, in each of the previous two meetings I have shared here, the team with the most wins against each other during the season has not won in the playoffs. Could that pattern continue? Fans from both teams will soon find out.